LONG BEACH, Calif. /California Newswire/ — Jonas Sills and Ray Buffer today announced their new performing arts company in Long Beach called Art-In-Relation (AIR). Their first production, 'Frankenstein The Musical' will open Oct. 23 at the Ernest Borgnine Theatre inside the Scottish Rite Event Center in Long Beach. The two producers also appear in this powerful production, as Victor Frankenstein and The Creature, respectively. "We are thrilled with this new endeavor to bring a local premiere of this hauntingly beautiful musical to a gorgeous jewel of an unknown space in Long Beach," says Sills, co-creative director, Art-In-Relation. "Frankenstein The Musical" is based on the original novel by Mary Shelley and has music by Mark Baron, lyrics by Jeffrey Jackson, and a book by Jackson and Gary P. Cohen. 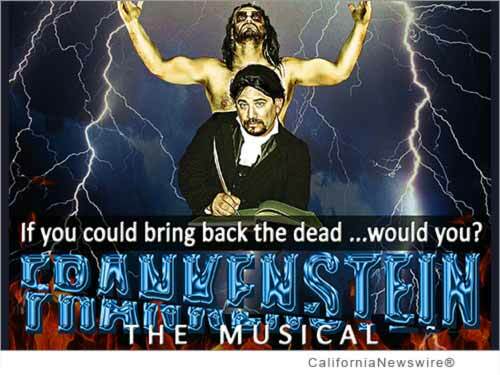 Produced originally off-Broadway as "Frankenstein: A New Musical" The show ran for a few weeks in 2007 before closing, while "Young Frankenstein" thrived on Broadway. Buffer and Sills recognized the untapped potential of the beautifully written piece and adopted it as their inaugural production. Never before produced on the West Coast, this production will serve as a premiere in Long Beach. The story follows Shelley's novel quite closely, and is ultimately about man reaching for the power of God, while battling greed and hubris. Victor is a tragic character who means well. He simply wants to learn the secrets that would allow him to bring back to life someone he lost when he was young – his mother. But the path he takes awakens a beast that craves revenge and methodically robs others – that Victor loves – of their lives. A talented cast of over 20 performers have been rehearsing furiously in Torrance and Long Beach to bring this secret gem of a work to life. Almost like an opera, "Frankenstein The Musical" weaves melodic lines into the persona of characters, and then brings them back to create feeling and nostalgia. Sills, a vocal artist by trade, gets to lavishly showcase his range and power playing Victor Frankenstein in a tour-de-force performance, hardly ever leaving the stage in this mostly sung-thru musical. The costuming by award-winning costumer, Michael Mullen promises to be a creative melding of late 1700's garb with steampunk flair. The choreography by Long Beach's own Nichole Beeks is infused with creative furor, style, and elegance. Award-winning lighting designer Jean-Yves Tessier will be bringing the visual elements into focus and the music is grandly presented and ingrained into the cast by Music Director, Stephen Pu, under the guidance of show director, Ray Buffer. "Frankenstein The Musical" is a must-see event, presented near and on Halloween for your enjoyment. See it October 23, 24, 25, 30, 31 and November 1 at 8 p.m. Tickets are only $25/$18.50/$10 and may be purchased online at http://www.brownpapertickets.com/event/778164 or by phone at 1-800-838-3006. The Ernest Borgnine Theatre is at 855 Elm Ave., Long Beach, CA 90813, with plenty of parking. Learn more about Art-In-Relation at: http://artinrelation.com/ or on Facebook at: https://www.facebook.com/artinrelation .